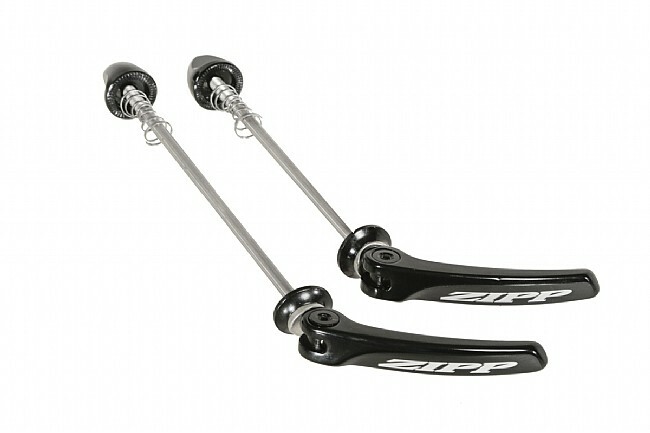 Zipp's Stainless Skewers are more aerodynamic and lighter than ever. Plus, the new lever design makes them easier to clamp down tight. Stainless steel shafts with alloy lever and end-caps. Length: 100mm front and 130mm rear. Works best for road bikes. Claimed weight for the Stainless Skewer Set is 84 grams. I got them mostly because I disliked the look of the ones that came with the bike. But when i got them, I was surprise how much lighter they were. I like the fact that they are stainless and are lighter than the ones I got with my, look better and should outlast the oem skewers as well. Sharp stainless steel by Zipp. They work perfectly with my Shimano Ultegra hubs, look real nice and will never rust like the original skewers.